Classical module systems support well the modular development of applications but do not offer the ability to add or replace a method in a class that is not defined in that module. On the other hand, languages that support method addition and replacement do not provide a modular view of applications, and their changes have a global impact. 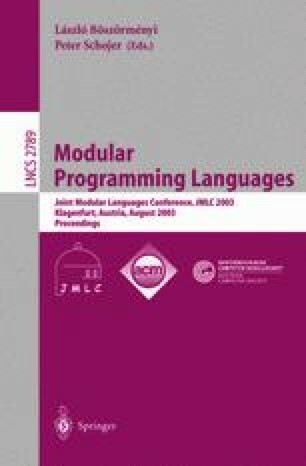 The result is a gap between module systems for object-oriented languages on one hand, and the very desirable feature of method addition and replacement on the other hand. To solve these problems we present classboxes, a module system for object-oriented languages that provides method addition and replacement. Moreover, the changes made by a classbox are only visible to that classbox (or classboxes that import it), a feature we call local rebinding. To validate the model, we have implemented it in the Squeak Smalltalk environment, and performed experiments modularising code.